Before I arrived in the village, nothing led me to suspect that tonight there would be a secret meeting about the murder of a certain Ramiro. In fact, I had very little to do with the man; and it’s not his loss that brings me here, but the discovery that it was my friend Lucas who killed him. A group of neighbours came to look for me as soon as I got back from the city, to persuade me to come to the square. I noticed it had been remodelled; and now that nobody’s attention is on me, I can see it looks even stranger because of the number of people coming and going, with all their questions and comments. From amongst the crowd a fat, sweaty woman emerges, claiming that she had been there when they killed Ramiro, and trying to give me as much information as possible. She’s acting as though she’s known me for years, and the truth is I can’t recall having ever seen her before. But that’s not important. She’s talking about Lucas and doing so as though he were a despicable human being. This woman is irritating: she grabs my shirt, shrieks and goes on with her accusations. I’m on the verge of giving her a reaction, and if I contain myself it’s only because I realise that nobody around me is disconcerted by what she’s saying. I’m reluctant to accept these assertions about Lucas. The two of us used to live two streets from this very square and we were always good friends. He never stopped writing to me when I had to travel and be away for long periods; and he never mentioned any kind of grudge against Ramiro. Most of his letters just referred to his love life, his amazing collection of butterflies, and his book of dreams. I need a way to show them Lucas is innocent, or else a way to convince myself he’s guilty. I’m sure they’re all aware of my friendship with Lucas; but a skinny man with a thin moustache, I think his name is Antonio, confuses me by trying to take me up to a tired, solemn looking individual who it seems is the victim’s younger brother. The others gather around and ask me to take them to Lucas’ hiding place. Like I’m supposed to know where that is! I shrug my shoulders in response and they get even more worked up. Two men come up to me and I manage to recognise them; they went to high school with Lucas and me. One of them has confirmed him as the killer. He says the two of them had been winding each other up for months and it was only a matter of time before one of them set out to kill the other. My friends leave me so they can join the mob.It’s impossible to quell the excitement in the crowd. The man with the skinny moustache raises his voice, almost shouting; he calls for people to go looking for Lucas, saying Ramiro’s death must be avenged. Everyone agrees amidst the cries. An anonymous, high-pitched voice calls out that Lucas is hidden six streets from here, in the attic of the house where Lina, the prostitute, lives. We start walking up. And I don’t know how, but after a few minutes, I find myself leading the march, with Ramiro’s brother at my side. We take a firm grip on the knives they pass to us. Neither of us has tried to speak. We’re close, and I can see the attic from here. The lights are out. It seems like there’s no-one there; but I know Lucas is waiting for me. Ramiro’s brother has moved back a few paces. All the shouting has deafened me. At the entrance to the house I lift my head and everything upstairs looks calm. Only then, before I start to kick down the door, do I imagine Lucas sitting on the edge of a bed, pulling the pins out of his butterfly collection. Translation of “Everyone, out in the square.” Copyright Ricardo Sumalavia. By arrangement with the author. Translation copyright 2013 by Ruth Clarke. All rights reserved. 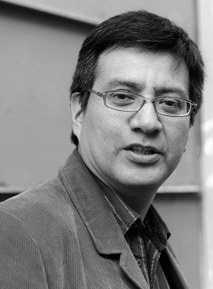 Ricardo Sumalavia (Lima, 1968)He has been a lecturer at the Universidad Católica del Perú and coordinator of its Centre for Oriental Studies. He spent several years in South Korea, working as a teacher. He currently teaches at the Université Michel de Montaigne Bordeaux 3, France. He has published short story collections: Habitaciones [Rooms] (1993), Retratos familiares [Family Portraits] (2001) and Enciclopedia mínima [Encyclopaedia Minima] (2004), and two novels: Que la tierra te sea leve [Let the Earth Lie Light on You] (2008) and Mientras huya el cuerpo [While the Body Flees] (2012). I really enjoyed this short story. It was surprisingly good!